The Vanilla Pod was one of four restaurants offering prix fixe menus for Summerland’s Light up the Vines. 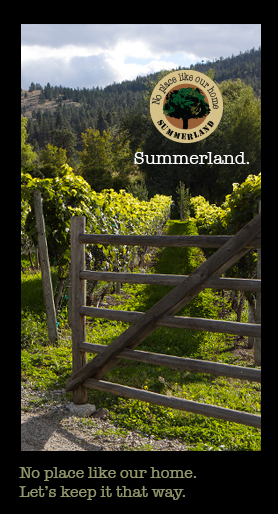 The event, a critical success for the participating wineries, also drew a number of new customers into the downtown area of Summerland. After touring the wineries of Summerland, one of the hot spots in town was the Vanilla Pod restaurant where Chef Bruno Terroso served up a tapas tasting menu, each course paired with Summerland wines. The menu was a standout – beginning with the smoked salmon garlic goat cheese on warm baguette, and paired with 8th Generation’s ‘Confidence’, which is a lovely frizzante containing a hint of grapefruit & cranberry, mixed with field berries. 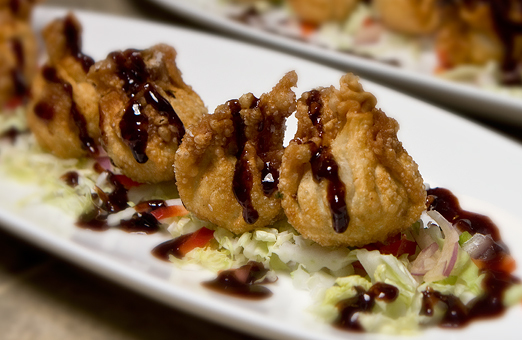 The spicy shrimp wonton with a chili plum sauce, which is pictured above, accompanied SummerGate’s Riesling, a relatively new winery with a focus on producing top quality wines. A halibut stew with an unpronounceable Portuguese name is a specialty of Chef Bruno’s who is of Portuguese extraction. The stew’s smoked paprika gives it a bite and when paired with the Haywire Gamay ‘Noir Rose’, it worked perfectly. But the highlight of the tapas menu was the beef short rib served with squash and yam mash, with a rich braising jus. The beef cut like butter and had an exquisite taste. It was a dish that was both rustic and elegant at the same time, and was welcome for its comfort factor after a chilly night out in the vines. The dish was paired with a 2006 Sumac Ridge Black Sage Meritage, that owner Paul Jones pulled from his private collection, for the Light up the Vines event. Thank you Paul! The evening ended on a perfect note with an apple stilton tart smothered in caramel and crushed pecans and paired with a 2008 Thornhaven Diosa. Sounds like a great initiative; very creative and I hope it is an ongoing annual event! I agree Toni… on all three counts!